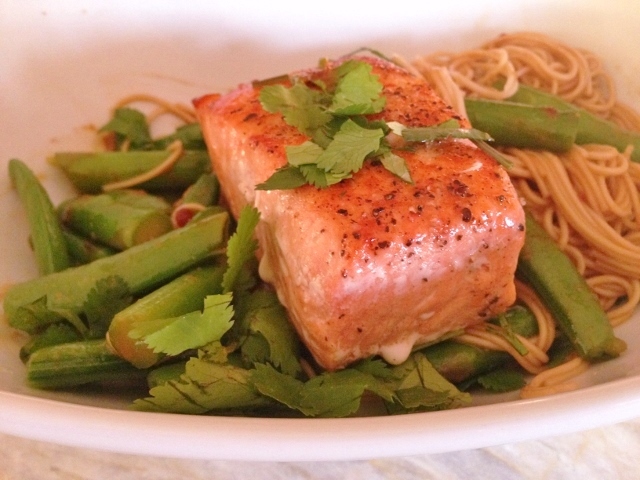 Thai Peanut Salmon & Noodles - Recipe! - Live. Love. Laugh. Food. 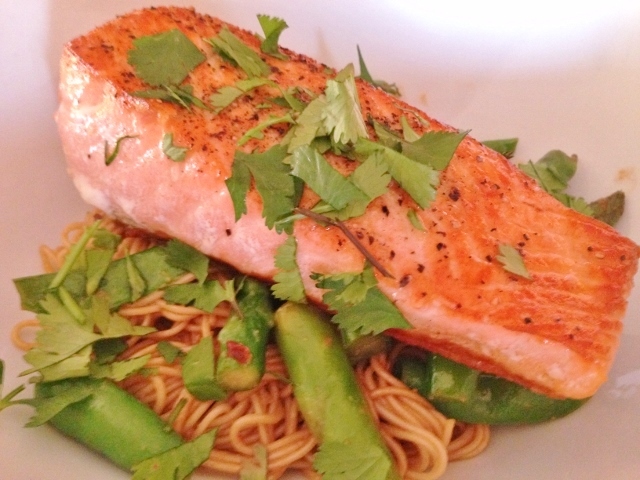 Thai Peanut Salmon & Noodles – Recipe! I love to cook, but after a few days of cooking and entertaining, I want to make my meals a little simpler with not a lot of fuss. I enjoy the flavors of Asian food, but sometimes it can be heavy, especially if cooked in a lot of oil. However, there are ways to create recipes that are light and easy without skimping on taste. I find that eating fish, instead of heavier proteins is a great way to lighten up any menu, and if you prepare it with a mouth watering sauce, nobody will feel like it’s diet day. 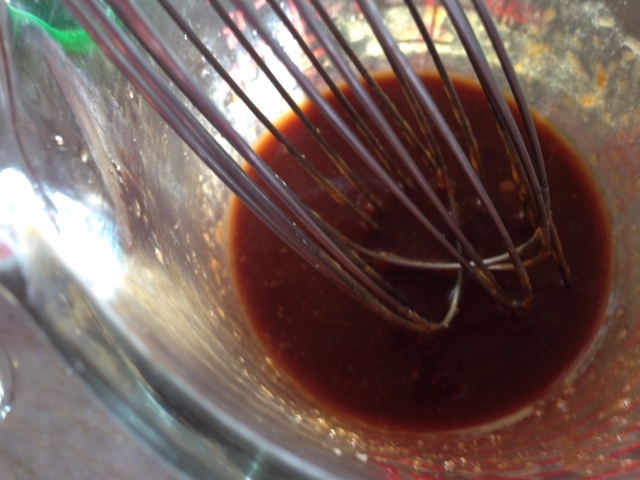 Peanut Sauce is one recipe everyone needs to keep in their back pocket because it is simple to throw together, and you can pour it over noodles, veggies and chicken or seafood. Salmon is one of my favorite fish to cook and it pairs nicely with my Thai Peanut Sauce. 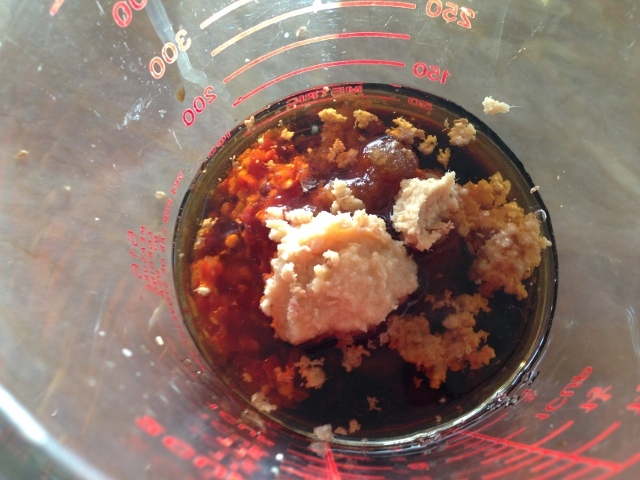 I mix the sauce ingredients ahead of time in a measuring cup, and then pour it right into the skillet. 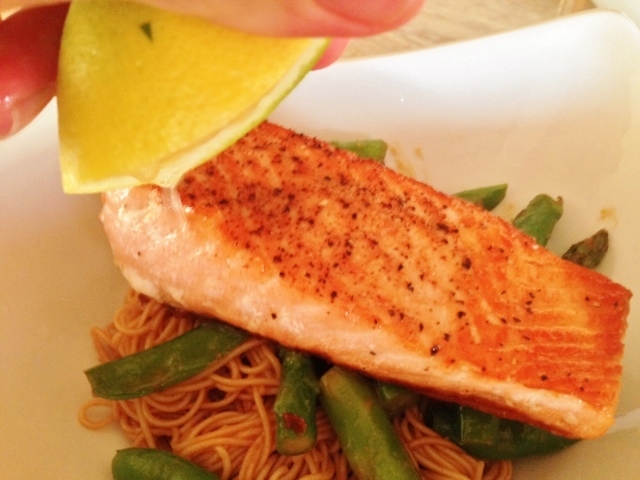 With a few additions; like veggies and noodles, this simple salmon meal will blow your taste buds away. 1. Boil a large pot of water on the stove top. 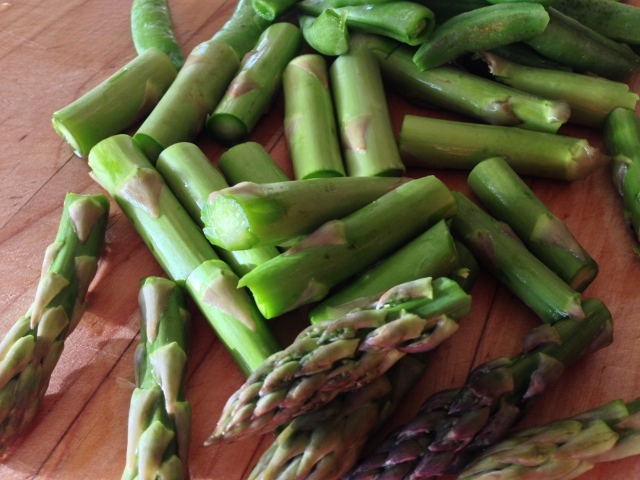 Wash and slice asparagus spears into thirds. 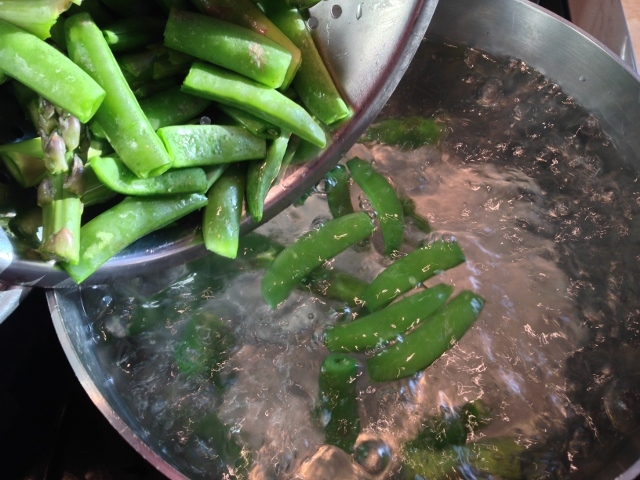 Wash and remove ends of sugar snap peas. 2. 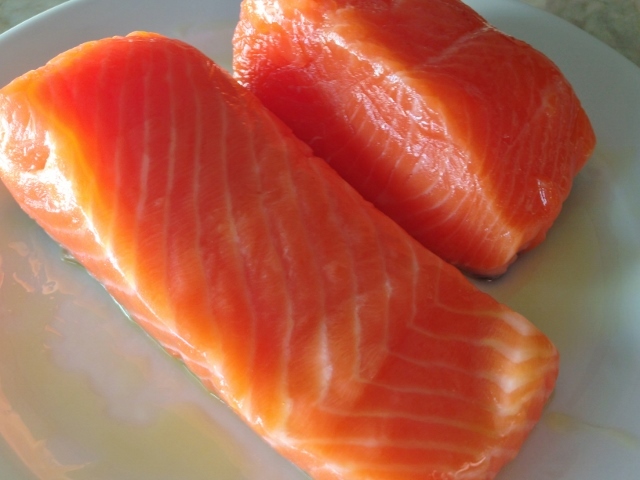 Remove salmon from packaging and place fillets on a plate with a drizzle of oil. Salt and pepper fillets. 3. Add a few tablespoons of salt to boiling water. Add veggies and blanch for 2 minutes. 4. 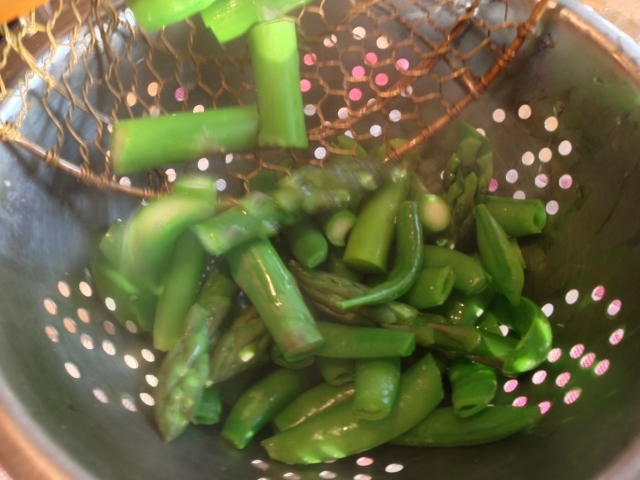 Remove veggies from water and drain. 6. Add 1 tablespoon of oil to skillet and place over medium heat. 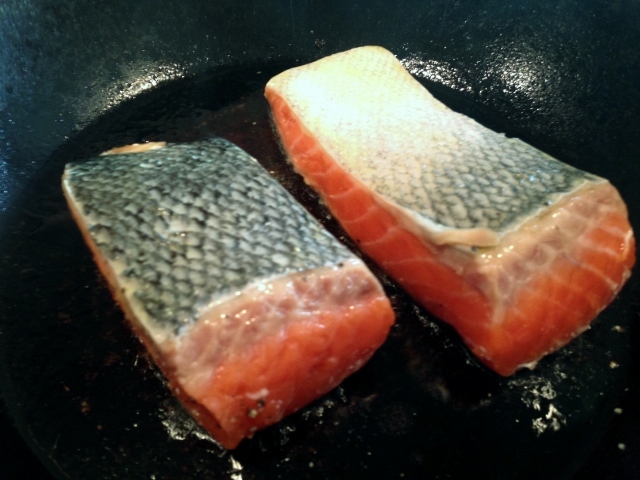 Add fillets skin side up or face down. 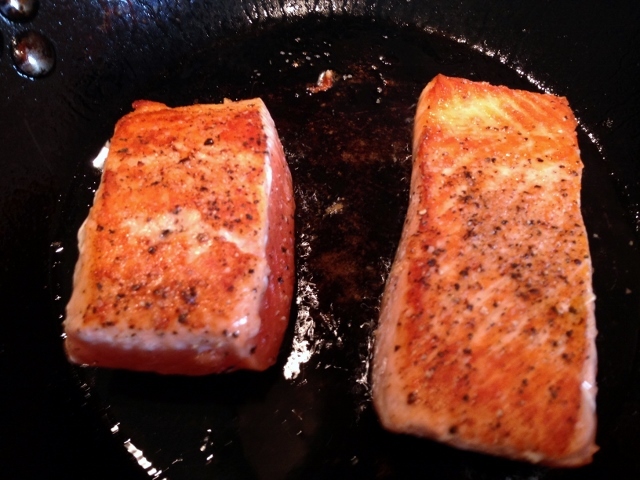 After 2 minutes, flip salmon over and continue to cook on medium heat for 6 minutes. 7. 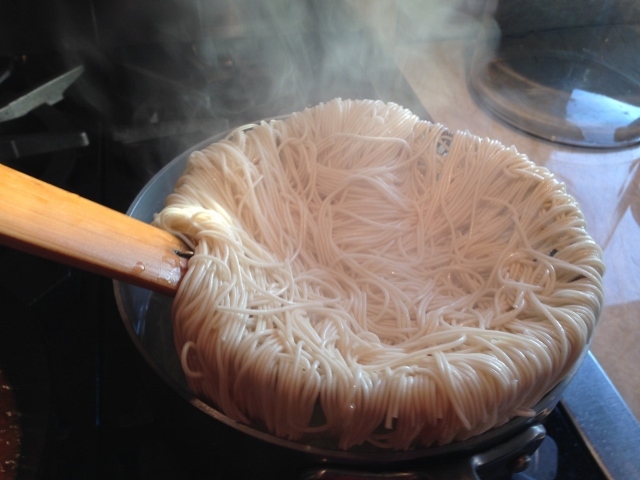 Remove noodles from packaging and add them to boiling water (the same water you used to blanch your veggies). Cook your noodles according to package instructions. 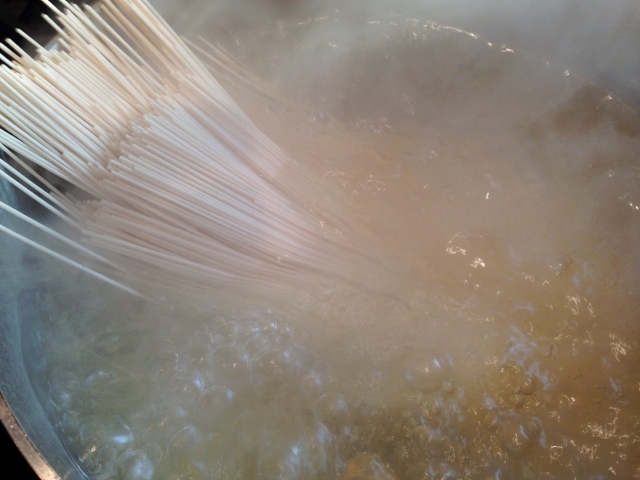 If using Somen or Soba noddles, it’s only 2 minutes. Do not over cook. 8. 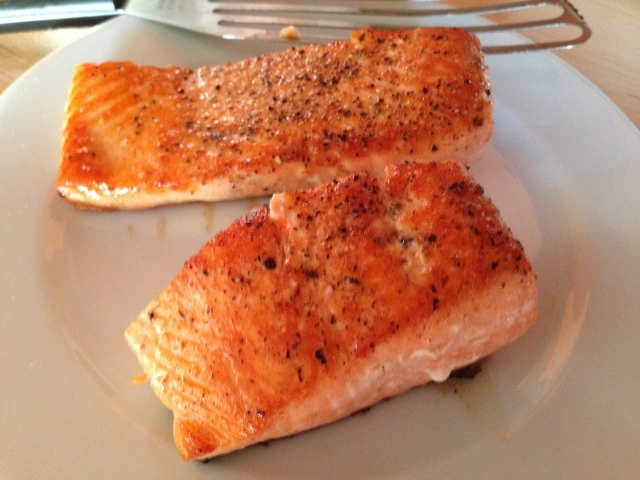 Place fillets on a plate to rest. 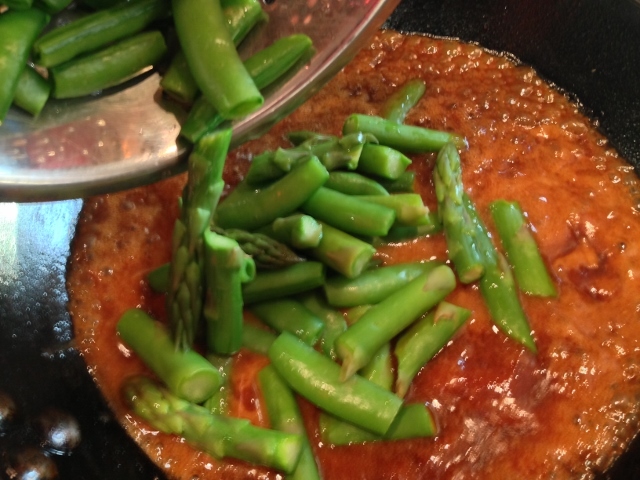 Add sauce and veggies to the skillet and cook for 1 minute. 9. 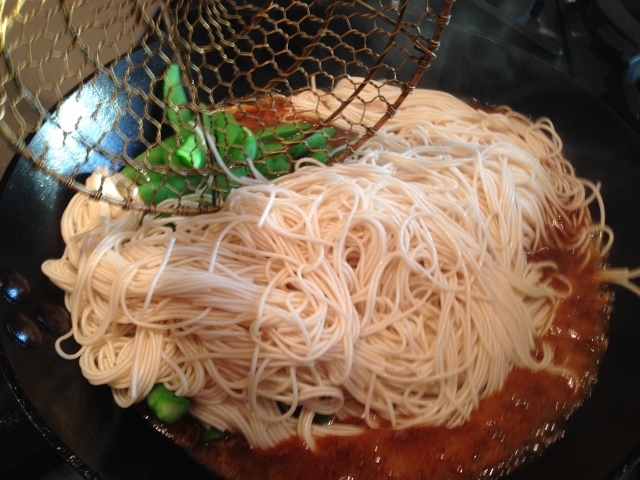 Remove noodles from water and place into sauce with veggies in the skillet. Gently toss noodles in sauce to coat. 10. Spoon noodles and veggies on each plate and top with a piece of salmon. 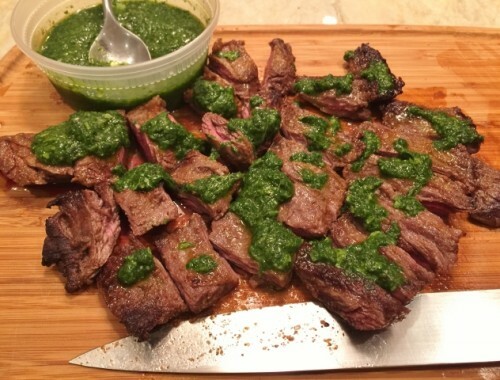 Squeeze with lime juice and a sprinkling of cilantro. Enjoy! 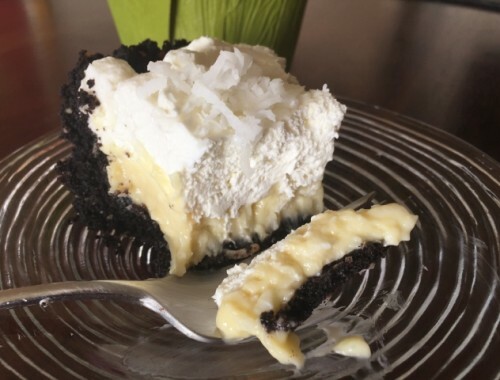 Coconut Cream Pie with Chocolate Crumb Crust – Recipe! 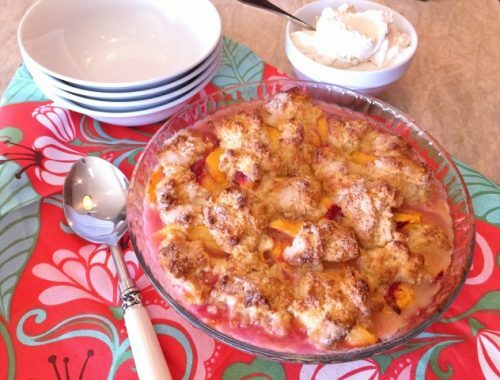 Peach Cobbler with Vanilla Bean Whipped Cream – Recipe!